Having created a fringe in Birmingham, made films, hosted conferences and created promenade theatre through the streets of London, it's now time we carried our work to an even wider audience. We've performed in the USA but the latest e-book technology can help us share stories around the World! Both books are now available on Amazon. Here's the draft introduction by Nick to Norman's memoir. "I think this is a book Frank McCourt, author of Angela's Ashes, would have loved. It has no artifice or pretension. It has not been written by an intellectual, an academic or even someone who had any desire to write or be published! This book is unique in that Norman Raybone was a working-class, blue-collar family man who was persuaded by his eldest son to jot down his memories. As you will read, Norman bought a computer and took lessons expressly to enable him to write his memoir. And now technology allows his story to be read anywhere in the world and I think he’d be impressed by that. This book is important for a number of reasons. It deals with a unique time in British history. Norman's story is that of 20th Century Britain, from its beginning with Zeppelin raids over the UK during the First World War, through the Second World War; the birth of the NHS; IRA bombs and the Millennium. It also has no agenda. And surprisingly little emotion. Norman's tenacity and timing with his writing means he is perhaps one of the very first 'citizen journalists.’ Technology now allows many people to record their life stories and recollections on endless blogs, on facebook and twitter and whatever new tech is round the corner. But Norman was one of the first, perhaps unwittingly, to use the new technology of the time, the PC, to tell his story. All for the love of his family. I first came across Norman at his 86th birthday party. I was dating his grandaughter! As you'll see in these pages, Norman could be a hard man and as I was somewhat older than his beloved grandaughter he initially eyed me with some suspicion. But over the course of his birthday meal we talked and I think he warmed to me. When he realised I'd written a few things in the past we started to compare notes. Norman couldn't understand why ANYONE would want to write! He found the whole experience very hard work, in spite of slaving away as a butcher and having run a few small businesses. Yet he obviously showed writer-like traits. As you will read, once he had started his project, he felt compelled to finish it to the best of his ability. And so he did. I spoke to him about the Maverick Theatre Company which I had established to present professional theatre in informal spaces and I think he liked the idea that I was doing it ‘for the people’. I also, without reading his book, said I'd love to try and get it to a greater audience that just his immediate family. It may have been because I was dating his granddaughter of course! And we'd also had a few drinks! But I've always believed we all have stories to tell and my most successful plays, PALS and A Ghost of A Chance, have all been based on normal people dealing with remarkable things - something we all do all the time in 'real' life. Norman was typically hard-lad Brummie. "Do what ya like with it, son. It’s there. If you want to publish it, help yourself. It ent that good and I can't write. So it's up to you." That was a few years ago. I carried on dating his granddaughter - and still do. Norman died in 2006. I got on with life but our conversation at his birthday meal in the chinese restaurant on the banks of a canal in Birmingham in the English Midlands stayed with me. And I finally got round to asking Norman's youngest son, Michael, if he had a copy of his Dad's book. Mike emailed me a copy with a warning that Norman was no writer. I immediately realised what Mike was talking about. If Norman had a tough day, he would write, "it as bin a tuff day." There were no paragraphs and few sentences. But what Norman COULD do was tell a tale. It was completely his story. No emotion. Practical. A tough, Birmingham lad. Angela's Ashes, by accident. And I was hooked. I know almost none of the characters in this first volume, but when he talks about his "Angel in the Green Dress," I get it as completely as any Hollywood RomCom movie. And if you know Birmingham, England, this is like a familiar journey home. Some of Norman's life was Dickensian. As a young boy, he stands outside in the cold waiting for his Mother to come home, staring enviously into windows of other families with full tables. But with Norman, we know this is how it happened. He's not after sympathy. This is how it was. It's completely truthful. It's his truth. He was special in that normal way we all are. I hope Norman and his family like what I have done to his story. Apart from paragraph and sentence construction it is still completely his story. I've tried to be true to Norman. It's very much his 'voice'. Partly because I think if Norman hadn't liked it, he would have told me in no uncertain terms!" 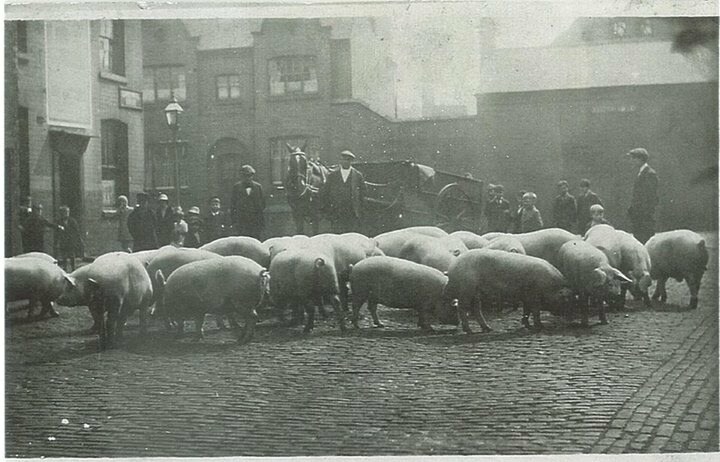 Picture: Herding pigs to slaughter through Digbeth, Birmingham. With thanks to Lynne O’Grady.